Mali Blues tells the story of four musicians from the West African country of Mali, who, with their music, ght for a tolerant Islam and a country at peace. Mali is one of the world’s poorest countries. In musical terms, however, it is richer than most any other country. AfroPop stars like Ali Farka Touré, Salif Keita, and Oumou Sangaré originate from the region between Timbuktu and Bamako in Mali, the birthplace of both jazz and blues. Yet the music of Mali is in jeopardy. Radical Islamists introduced sharia law in the country’s northern part, prohibiting dance and secular music, destroying instruments, and threatening musicians. Mali’s lifeline is hard hit. Many musicians are muted, have to go into exile, or ee to the capital Bamako. But the Islamist terror has by now expanded to other parts of Mali as well. The UN war effort is being further increased; the German Bundeswehr army is operating there, too. Mali’s musicians fight with their instruments, and their voices, for peace and reconciliation, for a tolerant Islam and societal change in their home country. 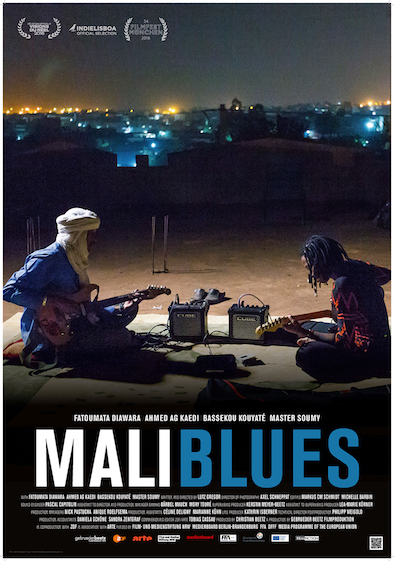 With subtle sounds and poetic images, though occasionally at full volume, Mali Blues portraits four exceptional musicians who, with their music, fight for a new awakening in Africa. Fatoumata Diawara – AfroPop’s shooting star, who tells in her singer/songwriter ballads of life as an African woman, and of obsolete tradition. Bassekou Kouyaté – the griot and Grammy-nominated world musician integrates traditional African instruments into modern rock music. Ahmed Ag Kaedi – his rough and rocking Tuareg guitar riffs tell of a longing for the desert. Master Soumy – the rap singer, voice of Mali’s young generation, whom corrupt politicians listen to alike.